London: George Allen and Unwin, 1943. First British edition of the economist’s ground-breaking work. Octavo, original cloth. Fine in a near fine dust jacket with a touch of wear. Housed in a custom half morocco clamshell box. Easily the nicest example we have seen of this work. 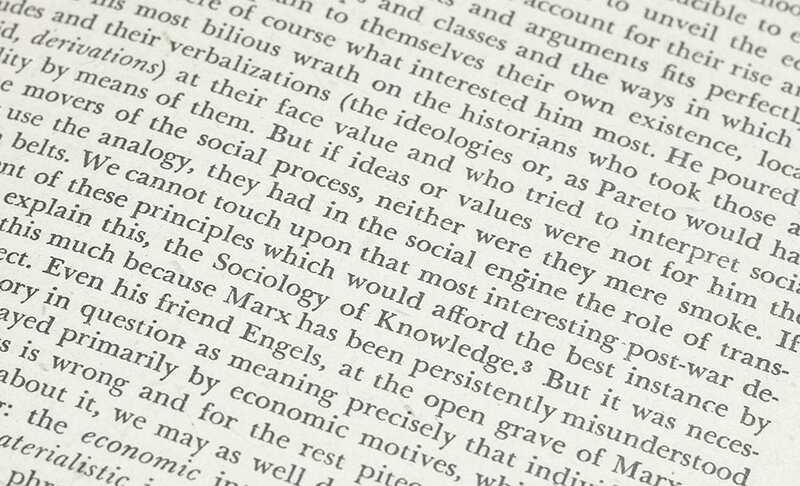 Capitalism, Socialism and Democracy is widely considered one of the greatest works on social theory written in the 20th century. Named by Modern Library as one of the 100 best non-fiction books of the twentieth century and by The Times Literary Supplement as one of the 100 most influential books since World War II. “Schumpeter was the most farsighted of twentieth-century economists. His focus on capitalism and creative destruction made him the prophet of globalization” (The Nation). New York: Harper & Brothers Publishers, 1942. First edition of the economist’s ground-breaking work. Octavo, original cloth. Near fine in an excellent dust jacket with a few small chips to the crown and foot of the spine. Housed in a custom half morocco clamshell box. Exceptionally rare in the original dust jacket. Business Cycles: A Theoretical, Historical, And Statistical Analysis of the Capitalist Process. New York: McGraw-Hill Book Company, Inc., 1939. First edition of the economist’s ground-breaking work. Octavo, 2 volumes. Original cloth. Some light rubbing to the cloth, a very good set of this landmark work. From the library of economist Moses Abramovitz, with his signature to volume one. Abramovtitz was known for his Catch-Up Growth Hypothesis, which attempted to explain what caused Western Europe’s Golden Era of economic growth from 1948 until 1972 and also for his work on business cycles. Housed in a custom half morocco clamshell box. Rare and desirable with noted provenance. First edition of the economist’s ground-breaking work. Octavo, 2 volumes. Original cloth. Inscribed by the author on the front free endpaper of volume one, “To Seymour Harris with kind regards Joseph Schumpeter.” Some light rubbing to the bottom of the cloth, a near fine set of this landmark work. 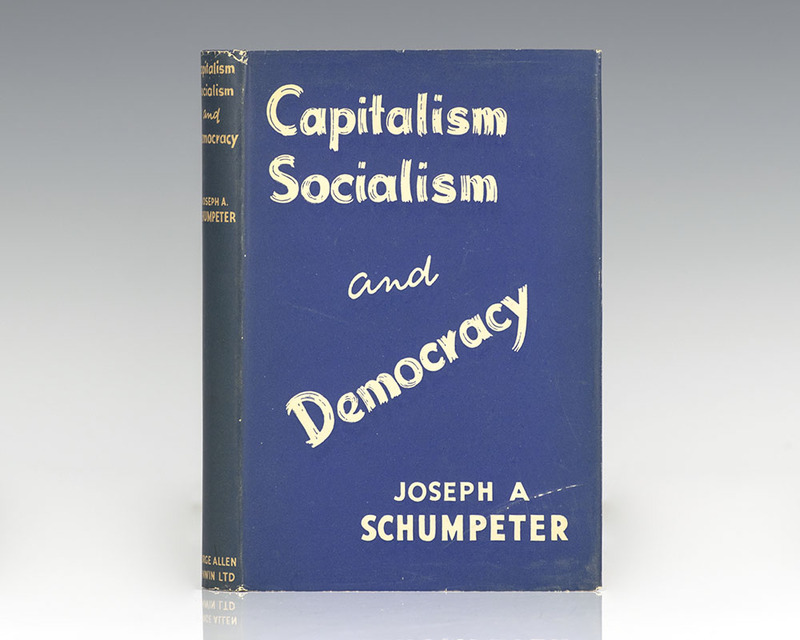 The recipient, Harvard economics professor Seymour Harris, was an editor of the book, Schumpeter as Social Scientist and editor of The New Economics; which Schumpeter was a contributor. 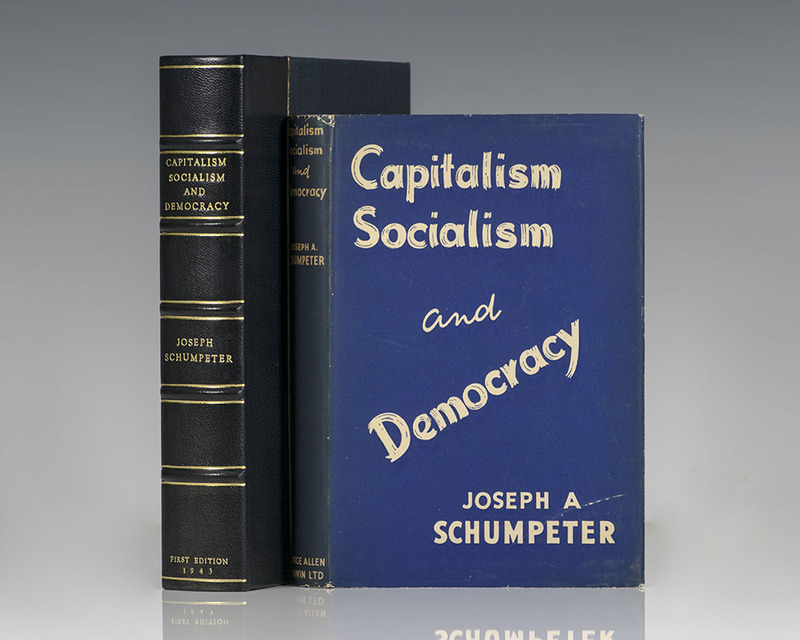 Books signed by Schumpeter are extremely rare and virtually unobtainable. Housed in a custom half morocco clamshell box. New York: Augustus M. Kelley, Inc, 1951. First edition. Octavo, original cloth. Economist Robert K. Arnold’s copy with his signature to the front free endpaper. Translated by Heinz Norden. Edited with an introduction by Paul M Sweezy. Fine in a very good dust jacket. First edition. Octavo, original cloth. An excellent copy in a bright near fine price-clipped dust jacket. Schumpeter, Joseph A. (Robert Solow). The Theory of Economic Development: An Inquiry into Profits, Capital, Credit, Interest, and the Business Cycle. 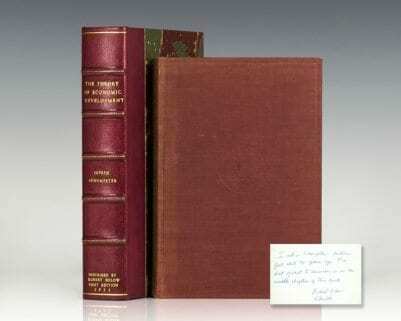 Cambridge, MA: Harvard University Press, 1936. 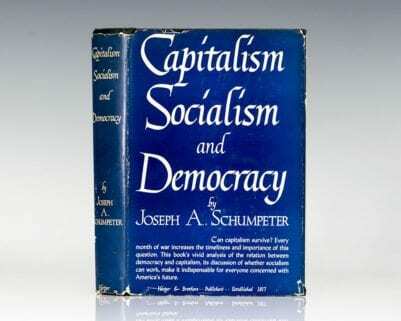 First edition of what many scholars believe to be Schumpeter’s masterpiece. Octavo, original cloth. Signed by Nobel Prize-winning economist and student of Joseph Schumpeter, Robert Solow on the front free endpaper, with the inscription which reads, “I sat in Schumpeter’s lectures just about 70 years ago. The best of what I remember is in the middle chapters of this book. Robert Solow 5/10/06.” Solow in reviewing Schumpeter’s work said, “In my view–and that of most contemporary economists, I believe–Schumpeter’s most original and most lastingly significant book was Theory of Economic Development, which appeared in 1911 (and was translated into English in 1934). It was at the University of Czernowitz, … that he worked out his conception of the entrepreneur, the maker of “new combinations,” as the driving force and characteristic figure of the fits-and-starts evolution of the capitalist economy. He was explicit that, while technological innovation was in the long run the most important function of the entrepreneur, organizational innovation in governance, finance, and management was comparable in significance.” In near fine condition. Housed in a custom half morocco clamshell box. First editions are rare. New York: Harper and Brothers Publishers, 1947. Second edition of the economist’s ground-breaking work. Octavo, original cloth. Fine in a very good dust jacket with rubbing to the extremities.